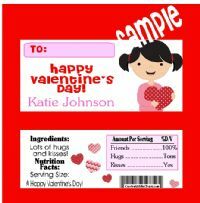 Carries Kiddie Closet's Sweet Valentine's Day Candy Wrapper favors are a fun way to celebrate the Holiday of Love! Our valentine wrappers can be used a valentine's day candy card and you can change all wording on our wrappers, including the To box which can be removed, if you prefer. All wording on the back of the wrapper can be changed as well. When ordering, please indicate in the personalization box below what wording you would like on wrappers. You may also email us your wording or request to see an email sample at shoregirl1000@aol.com. Our adorable candy wrappers make a fun gift, card or stocking stuffer! Our candy wrapper favors are just adorable. Our candy wrappers are perfect favors for first communions, baptisms, birthdays, baby announcements, baby shower favors, anniversaries, wedding favors and more. Carries Kiddie Closets personalized candy wrappers are a fun and unique party favor for all of your special occasions. *** Please note - if you add additional items to your order, email us the personalizaton for each item to shoregirl1000@aol.com.